This iconic Masai Mara is found in South West Kenya and is the northern continuation of the Serengeti in Tanzania. Completely unfenced, animals roam freely between the Kenya Masai Mara and the Tanzania Serengeti. 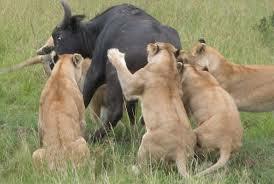 The Masai Mara is famous for its unbelievable wildlife viewing. This includes the Big 5 and of course the annual migration of wildebeest, zebra and gazelles from the serengeti Plains known as the Great Migration. This usually occurs between July and October. 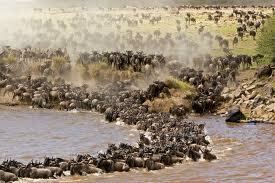 Even if you can’t make your holiday around the Migration the Masai Mara teems with wildlife whenever you go. The endless rolling grass plains dotted with acacia trees makes the wildlife easy to see. The permanent water source of the Mara River keeps the animals there. We highly recommend that you combine four National parks and National Reserves in one week. The down button are popular packages that will takes you to the northern Kenya, the central highlands, the rift valley and southern Kenya offering all different options in one safari itinerary. Amboseli offers one of the most classic and breathtaking views of Kenya, the gigantic Kilimanjaro mountain, with its 5,985 m dominating the plains like a powerful god ruling the world from his silver throne. Second in popularity after the legendary Masai Mara, Amboseli National Park not only offers great game viewing but it’s also the place to go for the best views of iconic Mount Kilimanjaro. The world’s tallest free-standing mountain actually stands just across the border in Tanzania, but Amboseli has a postcard-perfect view of its snow-capped peaks, rising almost six vertical kilometers above the savannah. 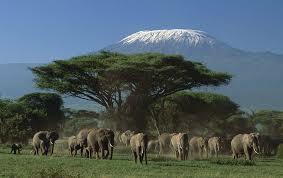 The best time to view ‘Kili’ is at dawn and sunset when the clouds lift and the light is clear and soft. Compact enough to experience in a day or two,Amboseli National Park is included on most Kenya safari itineraries and combines well with a Masai Mara safari or nearby Tsavo National Park – Kenya’s biggest conservation area. Close by lies Chyulu Hills National Park, a small conservation area based around dramatic, ancient volcanic hills that offer great views of Mount Kilimanjaro and are home to a range of animals that include elephant, buffalo, leopard and many antelope species. An Amboseli safari can also be combined with several Tanzanian parks. Mount Kilimanjaro National Park and Arusha National Park lie just across the border and are the closest, but the highlights of Northern Tanzania – the Serengeti, Tarangire and the Ngorongoro Crater – are easily accessible from this region. 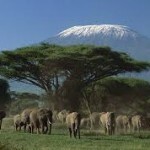 This 5Day safari covers lots of miles and three parks in four days with wonderful views of Kilimanjaro. Will enables you to experience a wide variety of landscapes, habitats and wildlife in a short time and includes a stay in the shadow of Kilimanjaro, Africa’s highest mountain perhaps with a chance to get a photo of elephants with the mountain in the background. 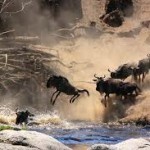 7Day Safari to Amboseli,Lake Nakuru& Masai Mara Kenya. This 7Day safari allows you to experience the wildlife of Kenya’s most scenic national reserves and enjoy sightings of Elephants and Wildebeest during the Great Migration.Our safari package offer you an opportunity to see the best Kenya has to offer, suitable for groups and individuals. See magnificent Elephants against the backdrop of snow-capped Mount Kilimanjaro and then explore the vast open plains of the Mara which teem with plains game such as Wildebeest, Zebra and Thomsons Gazelles during your Kenyan safari tour. Leave Nairobi for Masai Mara Game Reserve. Picnic lunch en-route. On arrival proceed to the Lodge. Afternoon game drive in search of Black manned lions, elephants, Leopard, cheetah, buffalo and other plains game. Dinner and overnight at the either Mara Sopa lodge, Mara Serena lodge, Keekorok Lodge Mara Safari club,Mara Intrepids,Mara Sarova camp,Mara Fig tree camp. After brakfast proceed for a morning game drive. Return to the Lodge for lunch . 16.00hrs after a rest continue for the afternoon game drive. Dinner and overnight at Lodge. Full game viewing in the Mara with an optional nature walk or a visit to a nearby Masai Village in between the meals break. Dinner and overnight at Lodge. After breakfast leave for Nakuru National Park to arrive in time for Lunch. Afternonn game drive. Dinner and overnight at either Sarova Lion Hill Lodge, L.Nakuru Lodge. 06.30 hrs, proceed for an early morning game drive in L. nakuru Park known for its huge concentration of flamingoes. The park is rich in other bird life and a number of the rare species of wild animals example Rothchild giraffe and white Rhino. After breakfast leave for Samburu, to arrive there in time for Lunch. Dinner and overnight at either Samburu Lodge, Samburu intrepids, Samburu Serena, Sarova Shaba, Larsens camp. 06.30 hrs early morning game drive and after breakfast proceed for the morning game drive. Return to the Lodge for lunch and rest. 1600 hrs afternoon game drive might be lucky to se the rare species of the Grevy’s Zebra and Somali Ostrich among the big five. Dinner and overnight at Lodge. 08.00 hrs after breakfast depart Samburu for Nanyuki at the base of Mt. Kenya for lunch. After drive back to Nairobi to Airport. 0930 hrs: Drive through the rich Kikuyu farmlands to the edge of the Rift Valley. Descend the escarpment and drive via Narok to Masai Mara Game Reserve. Picnic lunch served en route. 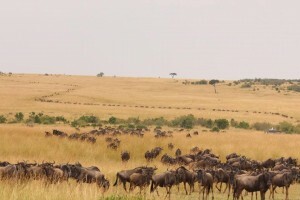 The Masai Mara adjoins Tanzania’s Serengeti National Park. Masai Mara is famous for its Black manned Lion and yearly migrations of Wildebeest and Zebra, Elephant, Buffalo, Rhino, Gazelle, Leopards, Giraffe are also found here. Afternoon game drive. Dinner and overnight at either Mara Sopa lodge, Mara Serena lodge, Keekorok Lodge Mara Safari club,Mara Intrepids,Mara Sarova camp,Mara Fig tree camp. A full day or morning and afternoon spent viewing and exploring this spectacular National Park. All the big five can be seen. 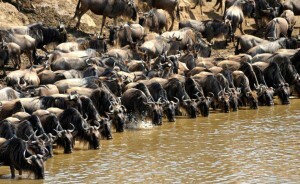 Masai Mara is also famous for its bird life especially at the Mara River. Meals and overnight at Lodge. After breakfast, leave camp/ lodge and proceed to L. Nakuru.On arrival check in at the Lodge and have lunch. Afternoon game drive. Lake Nakuru is famous for its pink Flamingos and many other types of birds. There are rare species of animals the white rhino and Roth child giraffe among a wide variety of game. Dinner and overnight at Sarova Lion Hill Lodge, L.Nakuru Lodge. After breakfast spend the morning watching and photographing the birds and wild animals in the park. Leave for Nairobi stopping for panoramic views of the Great Rift Valley en-route. Arrive in Nairobi in the afternoon and Trasfer to Airport for flight back home. 0930 hrs: Drive north via Mt. Kenya past coffee plantations to Samburu Game Reserve noted for the unusual reticulated Giraffe, Grevy’s Zebra, Gerunuk and Somali ostrich. Picnic lunch and game drive en-route. Dinner and overnight at either Samburu Lodge, Samburu intrepids, Samburu Serena, Sarova Shaba, Larsens camp. After breakfast proceed for game drive in Nakuru National Park. Lunch at 1200 hrs and depart for Nairobi arriving late afternoon. For transfer to Aiport and flight back home. The drive passes the small industrial town of Thika surrounded by extensive pineapple plantations. After crossing the Tana River, source of much of Kenya’s Hydro power, the landscape changes and becomes more lush as you climb into the rich farmlands of the Kikuyu people. Lunch is taken at the Outspan Hotel in Nyeri for visitors visiting Tree Tops, at Mountain Lodge and at Aberdares Country Club for visitors visiting the Ark. In the afternoon proceed to your Tree Lodge where the night is spent and where a procession of wild animals visit the floodlight water hole and salt licks. Elephants , Rhino, buffalo, giant forest hog and many other species are commonly seen. Overnight at The Ark / Treetops tree Lodge. Day 2- Aberdare | Nairobi. In the morning after breakfast descend back to your base hotel and proceed back to Nairobi in time for lunch/ Transfer to airport. Depart from your pick up point for a journey south along the floor of the Great Rift Valley past Narok and then climb the western wall entering Hemingway’s country; “Serengeti Plains”. Arrive late afternoon in time for lunch at your Lodge. Afternoon game drive. Dinner and overnight at Mara Sopa lodge, Mara Serena lodge, Keekorok Lodge Mara Safari club, Mara Intrepids, Mara Sarova camp, Mara Fig tree camp. A full day or morning and afternoon spent game viewing across the rich tree studded savannah grassland and rolling hills. 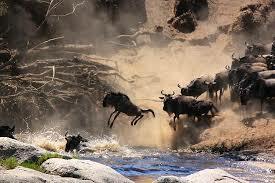 The famous Masai Mara is renowned for its great herds of plain’s game, black manned Lion , Leopard and Cheetah. It also has numerous elephants and virtually every type of Wildlife to be found in Kenya. All meals and overnight at Lodge. After breakfast depart for Nairobi, arrive in Nairobi late afternoon and Trasnfer to Airport. A night stop in the park enables a more leisurely encounter with the magnificent array of wildlife than is possible on the – day of safari. 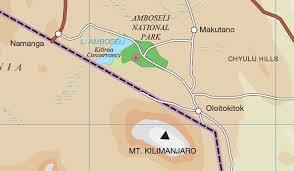 The tour leaves in the morning reaching Amboseli National Park in time for lunch. An afternoon game drive in the area of permanent swamps will reveal much game,large and small, eminently photogenic in these splendid surroundings. Dinner and overnight at either Amboseli Serena Lodge, Amboseli Sopa Lodge, Ol tukai Lodge. An early morning game viewing and after breakfast drive back to Nairobi to arrive before Lunch.